Over the last couple of years, Eben Kirksey has been a major figure in carving out a niche for the fledgling field of multispecies ethnography somewhere in between human–animal studies, feminist science and technology studies, and ecology. If his The Emergence of Multispecies Ethography (co-authored with Stefan Helmreich (Kirksey & Helmreich 2010)) was a manifesto for multispecies ethnography, Emergent Ecologies puts it into action. Drawing from roughly 20 years of fieldwork, Kirksey seeks to reframe the problems that have been haunting environmental conservation for decades: where does an ecosystem end? When is an alien species beneficial, when harmful – and to whom? Is conservation even possible, given the inherent dynamics of nature? Of course all these problems have already been discussed at length within the philosophy of biology and the ethics of conservation. Kirksey’s refreshing contribution lies in straying from those beaten tracks: while clearly interested in philosophical problems, he turns to ethnography to answer them. Going back and forth between Panama, Maine, Florida, Costa Rica, California, and New York, his case studies highlight how ecosystems are becoming increasingly intertwined, transformed, and populated by new inhabitants from all the kingdoms of life. Emergent Ecologies follows “ontological amphibians” who cross the boundaries of ecosystems–rhesus macaques in Florida, African clawed frogs in New York City, and ducks from Costa Rica to California–exploring the various ways in which species (including humans) mix or do not mix. Kirksey stresses the importance of overcoming a form of ecology that has dominated 20th-century thought and revolved around, among other things, issues like the separation of humans and nature, the conservation of pristine ecosystems, or the fight against invasive species. His local case studies become arenas to contest these concepts; against such backgrounds, Kirksey asks if the 20th-century model of conservation can do justice to the multispecies communities that have found new ways of living together. To him, this is not a simple question of getting one’s ecological theory straight, but one of understanding environmental practice as a form of political activity. Kirksey stresses that there are livelihoods, be they those of pythons, rice grass, or of humans, which depend on specific ecological assemblages. Environmental transformation, regardless of the aims and factors which drive it, transforms pre-existent ways of living and shapes new communities in which there will be a place for some but not for others. This understanding of political ecology is in line with many recent posthumanist books like Anna Tsing’s (2015) The Mushroom at the End of the World or Jamie Lorimer’s (2015) Wildlife in the Anthropocene. What makes Kirksey’s book stand out among such others is that he does not stop at including plants, animals, and other organisms within the body politic. More than anyone else, he is driven by the question of what we can learn from these others. While many authors, even in the field of multispecies ethnography, content themselves with talking about other species, Kirksey tries to take their perspective by talking to them. His spectrum of inter-species communication methods is diverse: from relying on human interpreters to undertaking biological field trips with high-tech equipment to performance art projects. While some of his experimental approaches might seem strange to a traditional conservationist, Kirksey is anxious to get his biology straight. Indeed, there may be few people in the field of multispecies studies who are so cautiouss when it comes to grounding their work in first-hand biological experience. Emergent Ecologies‘ eagerness in this respect is another refreshing element of the book; while there have been tendencies in posthumanist fields such as science and technology studies or new materialism to attack static or oversimplified theories from the natural sciences, an engagement with the objects of study themselves has often been lacking. If Kirksey confronts established ideas in conservation, ecology, philosophy, or biology, he always turns to the organisms themselves to get a more appropriate understanding. His account of Panamanian Ectatomma ants (pp. 17–35), for example, contradicts mechanistic and economistic understandings of these animals as much as it does away with the sometimes all-too-harmonic picture that some posthumanist scholars seek to paint. It is precisely Kirkey’s personal engagement with the insects, going back to his time as a biology undergrad, and his sincere interest in the ants’ life history that makes his arguments more convincing than the simplistic ideas of any of the two sides. If I do not give a brief outline of the contents of Emergent Ecologies it is because the book cannot really be boiled down to a single clear-cut argument. Instead, Kirksey has compiled his work as a bricolage of places, issues, and philosophies that are sometimes loosely, sometimes more strongly connected to each other. Along the way, he discusses an impressive crowd of authors and concepts, among them Peter Sloterdijk and his bubbles, Susan Leigh Star and torque, and Bruno Latour and the parliament of things, to name just a few. Kirksey’s engagement with past and current theories is very broad and bears witness to the ambition of his book. He does not stop at reassembling ecology; philosophy, too, needs a makeover. The ideas of thinkers like Heidegger, Uexküll, or Sloterdijk are too anthropocentric, Kirksey argues, to capture the extent to which the livelihoods of plants, fungi, humans, and other animals are mutually entangled. the singularity of human nature that is inscribed in such philosophies informs ecological theory and practise as much as it still forms the basis for critical response from the humanities. If we want to address the ecological issues of a world in which . In more than one way, Emergent Ecologies is a rich book: rich with encounters, with insights, rich with approaches. Occasionally, however, this richness has left me wondering whether less might have been more. While the allusions to other works and authors will be welcomed by those who are familiar with such work, a large part of these references might be unknown to most readers. As the citations are usually eclectic, and Kirksey drops concepts as quickly as he takes them up, their ultimate significance for the book’s argument often escaped me. This is not a major flaw, however, and is perhaps best understood as Kirksey’s deliberate decision to understand the world ecologically, not economically. With Emergent Ecologies, we learn to look for connections, relations, and associations, not for divisions, boundaries, and separations. Kirksey argues that we should say goodbye to old ideas of conservation that dream of a world where every species has its fixed place – and where aliens and foreigners should be removed for the sake of the natives and residents. Emergent Ecologies demonstrates that the distinction between native and foreign has become absurd in times of global trade and travel. At the same time, we should not hope for a world where the lion lies with the lamb: doing ecology will always require a decision for some species and against others. Embracing novel environments where introduced weeds, birds, and ecological practises is no less political “restoring” the same ecosystem by removing said alien species. To include one is always to exclude another. 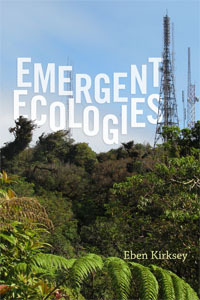 It is at this point, however, that the bricolage methodology and multi-sited ethnography of Emergent Ecologies become weaknesses as much as they have been strengths before – not because they are poorly executed, but rather because Kirksey employs them quite consistently and thoroughly throughout the book. It is not so much the author’s arguments as the book’s narrative style which detracts from its political message. While Kirksey points to the irreducible inconveniences of doing ecologies, exiting the scene in which they matter and to go somewhere else appears all too easy. But in following the author, we are also leaving behind those who are stuck, unable to escape the environment they are rooted in: exotic snakes in Floridian terrariums, Costa Rican peasants and conservationists, endemic frogs at the brink of extinction. Emergent Ecologies is careful in giving those who live with and among the wild things in Costa Rica, Florida, or Panama a voice. In quickly jumping between times and places, perspectives and situations, however, the book produces a certain relativistic effect: it becomes very hard to decide for or against a certain account, point of view, or species (the ninth chapter of the book, “Parasites of Capitalism,” is paradigmatic in this respect). In itself, the absence of a unifying perspective that is easily able to reconcile all the contradictions of political ecology should be seen as a productive provocation for the environmental humanities: it could be a call to reflect on one’s own position as much as as it could be a critical resource to challenge some of the all too premature solutions that are proposed for the political and ecological dilemmas of our time. The reader of Emergent Ecologies can escape this irreconcilability by switching to a different place, story, and issue. In following the author’s line of flight, she has the privilege to travel between distant places and the freedom to revisit her own conceptions of ecology, but is never really confronted with the inconveniences of being stuck in place. While Kirksey’s interest and concern for those who do ecological work in the places he visits are profound and genuine, I sometimes wondered what kind of book Emergent Ecologies would have become if, instead of the “ontological amphibians”– those travellers between ecosystems and worlds — he had focused more strongly on those who cannot travel as easily as ducks, rice grass, or ethnographers. Granted, in a time of global ecological change neozoa are a critical resource against the static categories of conservation and their susceptibility to technocracy, and Emergent Ecologies uses this resource masterfully. And yet, there is a blind spot in this approach, which will inevitably lead to the call to embrace novelty and let go of the idea of a state of nature that could be conserved. Since this approach is so fixed on doing away with the past, it does not provide any critical resource for telling the good novel ecosystems from the bad. Kirksey urges us to be careful in making such decisions, but will they thereby become easier, less painful, less political? My uneasiness with some of its political implications should not obscure that Emergent Ecologies is a great and innovative book. It is especially Kirksey’s experimental approach and his ignoring of disciplinary boundaries between biology, history, anthropology, and art while taking the methods of these fields very seriously that makes this book an important contribution to the body of literature on ecology and conservation. In its simultaneous appreciation of novel ecosystems and their inhabitants on the one hand and of the plurality of methods, theories, and perspectives on the other, Emergent Ecologies parts with the seemingly clear-cut concepts of traditional conservation as much as it leaves behind the comforting but deceptive certainties of established disciplines. Kirksey, Eben, and Stefan Helmreich. “The Emergence of Multispecies Ethnography.” Cultural Anthropology 25.4 (2010): 545–576. Lorimer, Jamie. Wildlife in the Anthropocene: Conservation after Nature. Minneapolis: University of Minnesota Press, 2015. Tsing, Anna Lowenhaupt. The Mushroom at the End of the World. On the Possibility of Life in Capitalist Ruins. Princeton: Princeton University Press, 2015. Veit Braun is research associate at the Institute for Sociology and a PhD candidate at the Rachel Carson Center for Environment and Society, LMU Munich. He works on the articulation of property and commodification in plant breeding from the perspective of science and technology studies. The question of how life eludes the preconceptions of the philosophies of property and economics is central in this respect. In a broader context, he wonders what politics might look like in a post-critical age.